Ross County defender Sean Kelly. Sean Kelly has become the latest player to commit his future to Ross County. 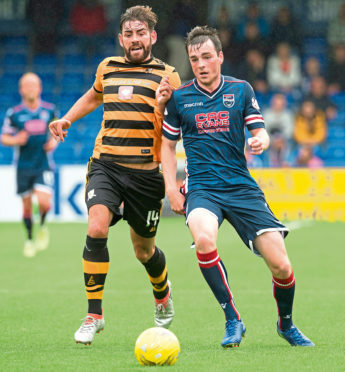 The former AFC Wimbeldon and St Mirren defender, pictured left, has re-signed for the Staggies’ Championship campaign after making 18 appearances in an injury-plagued first season. County co-manager Steven Ferguson sees Kelly almost as a new signing, as he did not play for the club after Ferguson and Stuart Kettlewell took over. He said: “We are delighted that Sean has committed his future to the club. In a sense it is like a new signing for us because he has never featured under Stuart or myself due to injury. Kelly was brought to Dingwall by former manager Jim McIntyre on a two-year deal after leaving Wimbledon. He was a team-mate of ex-County defender Jason Naismith, who moved to Peterborough earlier this week, both at Victoria Park nd at St Mirren.